In 2010, Tim Bauer weighed 440 pounds. He was only 31 years-old. One of the big problems was Bauer’s sedentary lifestyle. He sat all day, ate whatever he wanted, and came home from work to play video games. The result was that the father of two didn’t have enough energy to play with his two girls. Bobbi Brown’s Aunt Alice sits down with her niece, Linda Arrandt, to talk health and wellness. It doesn’t have to be a new year to make a commitment to better health. You can press the reset button on your health habits at any time. However, staying committed can be a challenge, and that’s where an Integrative Nutrition Coach can help. Since I was small, sugar has always been my drug of choice. It’s easy to see why. It makes you feel happy. It’s fun, colorful and alluring, not to mention, delicious. It can make you feel more energetic, as well as have the opposite effect and make us feel calm. When my father was 52 he had a heart attack. He thought he was in good health, and played sports regularly. He was actually playing racquetball when it happened. However, even though my father was active, it wasn’t enough. For the past 15 years, my sister, Bobbi Brown, and I have taken a week off together for our annual Mother’s Day trip. It’s a week to be together to nurture ourselves and strengthen our bond as best friends. The word detox conjures up images of fasting, cleansing and restricting food groups. Especially for a family, it can sound too extreme. Instead, as a health coach, I advise my clients to focus on eating clean. While most diets are about strict rules, deprivation isn’t always motivating. I learned about a concept called ‘crowding out’ from The Institute for Integrative Nutrition during my education that I always share with my clients. This! Just! In! It’s G&F’s Feel Good Beauty issue, and we’re dishing with beauty extraordinaire Bobbi Brown and her health guru sister, Linda Arrandt, on confident style. As women, many of us have a complicated relationship with food. It’s not just losing the struggle with the last chocolate chip cookie on the plate, or staring down that doughnut box at the office. 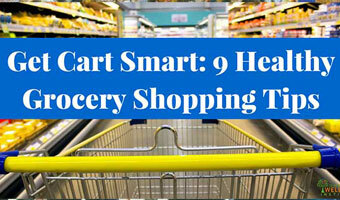 Grocery shopping can be daunting and confusing if you’re trying to buy healthy foods without blowing your budget. Certified Health Coach, Linda Arrandt, works with clients on making healthy shopping trips less stressful. Linda shares how she helps clients navigate the grocery store with these healthy grocery shopping tips. We’re chatting with beauty guru Bobbi Brown and her health coaching sister to talk beauty from within and beauty that goes on your skin! I love hanging out with my super smart and talented sister, Linda, no matter what the occasion. But I really enjoyed a recent sit down we had for Glossed + Found, a great online beauty magazine. Take a Walk with Health for Dressed for Success! 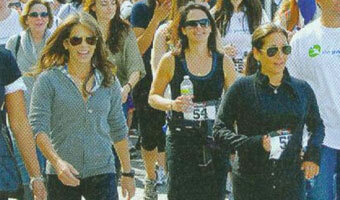 Bobbi Brown and Linda Arrandt walked with Jillian Michaels to raise funds for Dressed for Success! The Dressed for Success’ 5K fund raiser is offered around the country in 40 cities. Information can be found at: www.dressforsuccess.org. Dressed for Success Worldwide helps women get back into the workforce through beauty skills, resume writing, career counseling, proper apparel and styling. Board Member and Health/Contributing Beauty and Lifestyle Editor Bobbi Brown, Spokesperson, Jillian Michaels and Integrative Nutrition Health Coach, Linda Arrandt, pictured here at 2011’s Walk.